Making whipped cream from coconut milk? I'm not exactly sure, but something about how processed sugar is filtered through bone char. If you cook down the light version to get rid of some of that water content, you should be okay. Yup! I have an immersion blender with a "power whisk" attachment. Whipped up that coconut milk like no one's business! Sticking it in the fridge after firms it up a bit. How did you make paleo pavlova? It's my boyfriend's favorite dessert, but the sugar is gonna kill us. @ Stephen-Aegis: I thought about it, but I was looking for the best way to raise the fat to other ingredients ratio, so I blew right past butter and went with ghee. If you try it, please let me know how it came out! A lot of brands have some former of emulsifier (e.g. guar gum) that will prevent separation in the fridge. Look out for them on the ingredient list if you want a brand that separates. I love and hate you equally. THe trader Joe's stuff is 60 percent added water. That is why it is called 'light.' However, I still like the TJ stuff as the only ohter ingredient is water and all the other store bought stuff around here seems to have a lot of other added stuff as well as water and the taste suffers accordingly as I am sure the health does as well. @Paul : Thai Kitchen was what i had on hand. @Paul and Scott : tried it, and posted results! Thai Kitchen definitely does it. And that's the brand that Jo was using. Oh yeah, that was one thing I was thinking, get the water out. Good to know. Another thought I had was that one could mix the thick coconut milk with some cream -- the milk kind -- and then you'd have a half and half whipped cream: half coconut, half milk. Yes, please. Don't hold back! I would like to know how this goes if you wouldn't mind sharing with us. Out of town so I can't try it myself. I can tell you that I'll be trying it before the weekend is out! TRIED IT! I figure that if your 30% figure is generally correct, I can raise the fat percentage with coconut oil melted in and then re-whip it! Hi, I'm Adam and I'm a foodie who is excited by this idea! Edit for Experiential UPDATE: Using a fresh can of Thai kitchen coconut milk (which separates in my cool, but not cold pantry), I tried a small batch whipping it with just the cream off the top. B+: Pretty good, kinda runny. Finally I tried boosting it up with a small amount of Ghee to change the Fat %. !!!!!! This whipped up great, was stiff enough to have some tiny peaks when I pulled out the blender, and the taste was incredible. I'm currently high on good fats. The good smell from the last combination had all the pets of the house in the kitchen staring at me, trying to get me to drop some. I have to tell you I made two batches of coconut milk whipped cream for a vegan cake I baked for my lactose intolerant daughter. One batch of the whipped coconut milk had almond flavoring and a bit of vegan sugar; the other had pure vanilla bean syrup with no sweetening. Both were big hits with my family. I used regular (non-"light") coconut milk I purchased in the Asian food department of my grocery store and chilled the cans overnight. The real trick is the use of an immersion blender; I tried it first with the blade -- didn't work -- put the whisk on the machine and like magic, I had thick "peaked" cream in about 15 minutes. I use this immersion blender all the time in my kitchen and wonder how I ever got along without one! I make coconut milk pudding. Whip until stiff. Refrigerate. Yum! P.P.S. I tried adding some coconut oil to the mix. It essentially made a frosting-type thing. Too thick! I'm thinking I'll add less next time, but increasing the fat content is definitely the way to go! I tried this once for a pavlova and I wasn't impressed with the results. Basically I tried adding tapioca starch but it never thickened up appropriately. Perhaps if I cooked the tapioca in the coconut milk then things might have turned out better, but I was in a hurry so I just bought some whipping cream and went to town. In general, you're probably going to want to add saturated fat, protein, or some other binding agent to the mix to make it more clumpy, and chill it to make the fat firmer. Even just adding a fine powder, like cocoa, will help a little to make a stiffer aggregate. Heat the coconut milk on the stovetop first to boil off some of the water content, then refrigerate. Mix creamed coconut and coconut milk. The difference is mostly in the water content here. Add some type of protein powder. I don't consume these (or recommend them) so I can't really comment but adding casein-free whey powder is one potential solution. Another thought would be to add someegg whites. 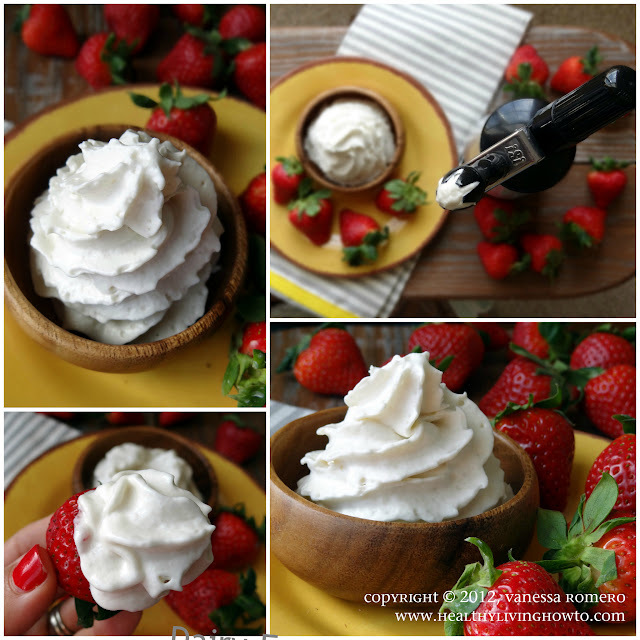 @felix2581 I have struggled with making coconut whipped cream in the past. Sometimes it didn't get "fluffy." I recently came across a recipe by Against All Grain that I found helpful. I summarized some of her tips (use full-fat coconut milk, make sure it is chilled, only scoop out the coconut cream portion from the can, etc.) and included the simple recipe in my post below (only ingredients are coconut milk and honey). In her article she also compares brands of coconut milk and explains which one worked best for whipped cream. Here is the my article, in it I included a link to Against All Grain's recipe: http://bamboocorefit...-whipped-cream/ . Hope this helps some! @Felix2581, I have struggled with making coconut whipped cream in the past. Sometimes it didn't get "fluffy." I recently came across a recipe by Against All Grain that I found helpful. I summarized some of her tips (use full-fat coconut milk, make sure it is chilled, only scoop out the coconut cream portion from the can, etc.) and included the simple recipe here (only ingredients are coconut milk and honey). In her article she also compares brands of coconut milk and explains which one worked best for whipped cream. Here is the my article, in it I included a link to Against All Grain's recipe: http://bamboocorefit...-whipped-cream/ . Hope this helps some! what is vegan sugar? Isn't sugar already vegan since it is a plant and does not contain any animal product whatsoever? Okay, love this. Has anyone used coconut milk as a sub for whipping cream in cooking recipes? I have a pasta I like to make with lemon and heavy whipping cream, but I am hoping to sub coconut milk. I have the "light" Trader Joe's on hand and I wonder if it will be creamy enough for a sauce. Also - I wonder if the taste would be odd. Any other ways to use coconut milk in cooking (other than curries, of course)? I am still looking through the posts, so forgive me if there's a post w/ recipes. I wonder if coconut cream would work better?